Unarguably one of the greatest players in the NFL, Tom Brady has had a remarkable run as the industry-standard in American football. From being an inexperienced quarterback and in the sidelines, Brady has unpredictably spent his entire career on a single team, leading them to several Super Bowls victories. For about two decades, the five-time Super Bowl winner and one of NFL’s top stars has recorded many accomplishments in his career akin only to legendary quarterbacks. Also considered one of the richest and highest-earning football stars in the United States, here are detailed facts about the New England Patriots quarterback and an all-time NFL great. Tom Brady was born on August 3, 1977, as the first son but the fourth child of European parents Thomas Brady Sr. and Galynn Patricia. He was born, raised and also attended high school in San Mateo. As a child, Brady was sports inclined as he played various sports including basketball, football, and baseball while in school. Before his graduation in the year 1995, Brady was part of the Junipero Serra High School’s football and baseball team, where he exhibited excellent athletic skills. Growing up, he had several influences that piqued his interest in football. Firstly, his parents were big football fans who supported the San Francisco 49ers. More so, Brady and his three sisters often went along with their parents to watch games. Even more interesting was the fact that Brady and his siblings regularly played competitive football and basketball most weekends in their house. Again, one of Brady’s childhood idols, quarterback Joe Montana was a major influence in shaping his career choice in professional football. Immediately after high school, Brady was drafted as a catcher by the Montreal Expos. But the star quarterback ditched his chance to play professional baseball and instead chose to play college football. He then proceeded to the University of Michigan on scholarship where he played quarterback for the school’s football team. Though he had an average start in college, Brady however later picked up and helped lead his team to an Orange Bowl victory in his final college season. Tom Brady’s professional career began in the year 2000 when he was drafted into the NFL in the sixth round as the 199th pick by the New England Patriots. Though he was initially rated low by pro scouts, Brady eventually gave his team value for their money on the field as he proved himself to be one of the best players in the draft. Tom first began as a backup quarterback but in his second season, he got the chance to be a starting quarterback and his outstanding performance led his team to their first Super Bowl win. Refusing to rest on his laurels, Brady led his team to four more Super Bowl victories in different seasons. His productive efforts consequently established him as a household name in the sport and also earned him three Super Bowl MVP Awards. Given how valuable a player he is to the Patriots, Brady was rewarded for his efforts as he had his contract renewed and extended twice, one in 2005 and then in 2010. Besides Tom’s impressive winning streaks, he is also a trailblazer who has broken records in the NFL. Brady won his first Super Bowl at age twenty-four setting a new record at the time as the youngest quarterback to achieve the feat. At age twenty-six, he also became the youngest quarterback to win two Super Bowls. More so, he made history as the very first quarterback in the NFL records to win five Super Bowl championships. The star quarterback is equally the second ever to earn three Super Bowl MVP Awards. Even off the field, Brady is doing quite well for himself. Though he has presumably past his peak days, the meticulous and self-assured Brady is not done making a legacy but maintains a strong desire to keep going for a couple more years before signing off the field. The strikingly handsome NFL star who was in 2002 named one of People Magazine’s 50 Most Beautiful People, is married to Brazilian supermodel and fashion icon Gisele Bündchen. Brady and Bündchen who got married in February 2009 are proud parents to two kids. Before the end of that same year, the family-oriented couple welcomed their first child, a son Benjamin and in 2012, they gave birth to their daughter Vivian Lake. Despite their money and fame, the A-list couple prefers to wear their fame lightly and have so far done a good job in keeping their family protected from the prying eyes of the media. Once considered one of the hottest bachelors, Brady’s relationships have always made headlines. Before settling with Bündchen, the NFL star was in a long-term relationship with Bridget Moynahan. However, the relationship which produced a son named John Edward Thomas eventually ended in 2006. A standard list of the world’s richest athletes may not be complete without Tom Brady’s name being mentioned. 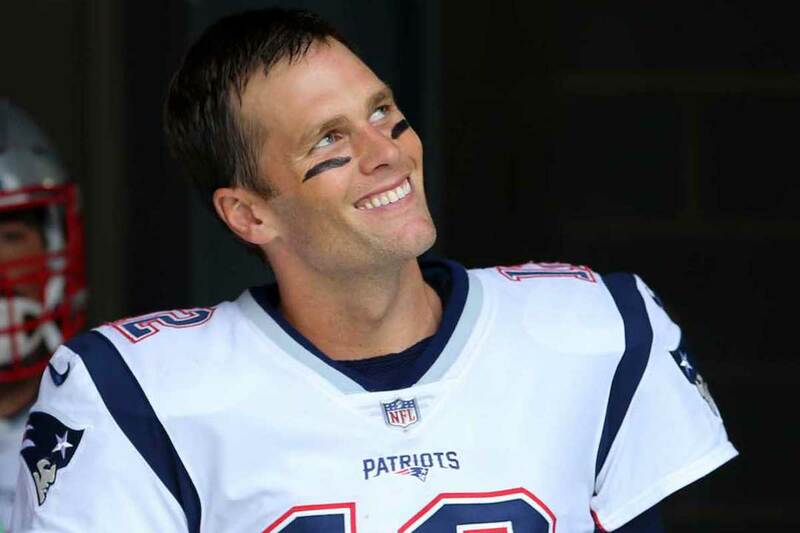 Though he earns a lot of money from his NFL career, the New England Patriots quarterback also makes major bucks from lucrative endorsements deals from popular brands such as Tag Heuer, UGG, Under Armour, Intel and Shields, Aston Martin, and many others. Brady’s current net worth is estimated at $180 million. The star quarterback who enjoys a luxurious life with his family is known to spend his fortune on philanthropy, expensive diets, real estate, and extensive training routines. However, the large fortune which he has amassed for about two decades is nothing compared to that of his supermodel wife Bündchen whose net worth is pegged around $380 million. A combined estimate of the power couple’s joint bank account brings the Brady-Bündchen net worth to about $560 million.